For the first time since I left Barcelona, I got up this morning, fired up the engine and rode onto the road without a fixed destination nor a number of kilometers to cover for the day. 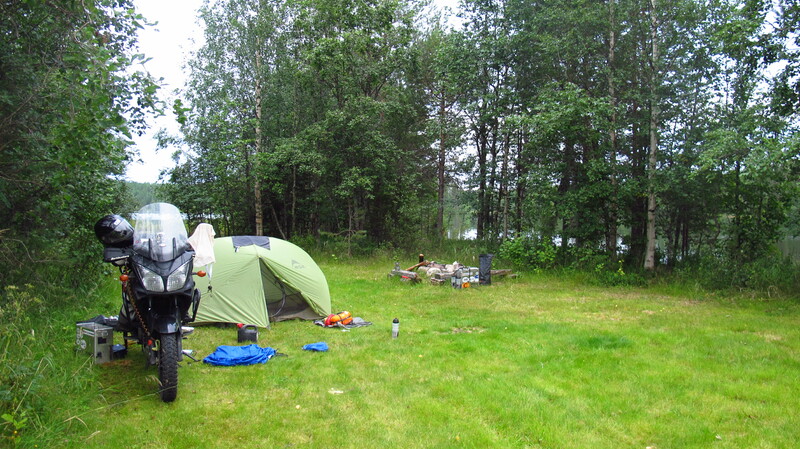 I had been unable to find a cheap hostel anywere, and the couch requests I had sent to Rovaniemi had been declined or gone unanswered, so I had decided to just ride and then find a campsite or somewhere to camp in the wild then I got tired. The previous day I had stopped at a petrol station at the corner of the street where the hostel was and bought a road map. The GPS had been of great help so far, but it had also kept me on main roads, which was fine in Russia, since anything other than main roads would be a nightmare to ride, but now I wanted to explore the back roads, I had to cover about 400km a day to get to the Nordkapp on schedule, which was not much taking into account how good the roads where in Finland, so I wanted to see the road network in detail and pick a route away from the main roads. Shortly after leaving Joensuu I saw that the main road went to the left of a big lake, and there was a smaller road to the right that went closer to the shore, even closer if I took a smaller road branching out of the first one. I went for it, and discovered a wonderful road. It was sunny, the temperature was perfect, the views breathtaking, I had my music on and there was nobody else around. 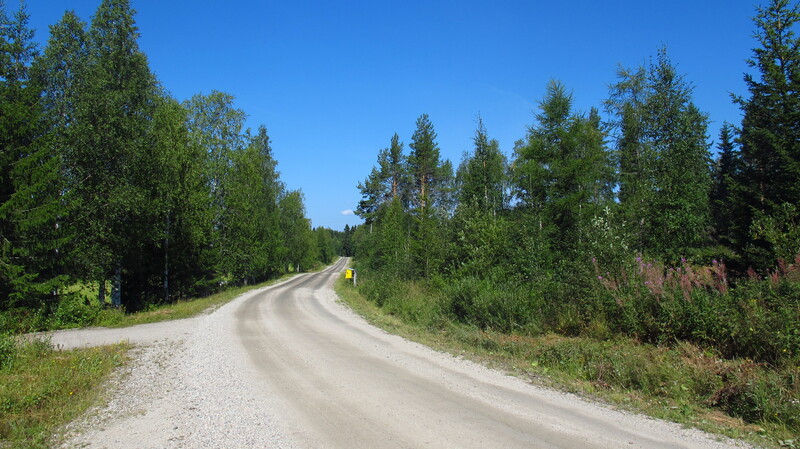 It had been a long time since I had had such a good time on the motorbike, and then the road turned into a gravel road, but not a Russian gravel road, a Finnish one, which are very good, and it was even more fun, riding on the footpegs, kicking up dust at 100km/h. I had started early, as I had got up at about 7 am, impossible to sleep more with the sun shinning as it does so early this far up north, and the first 200km felt more like 20. I stopped for petrol for the first time in Finland, the last fill-up had been in Russia just before the border, and was glad to discover that while it was a bit more expensive than in Spain, the price was still within budget and lower than Italy, the most expensive I had paid so far. I also checked the prices at the petrol station café and they were also very reasonable, I had a menu for 8€. While I was outside the café putting all the gear back on a KTM parked next to me. It was an Adventure S in Dakar colours, in pristine condition. I told the rider ‘nice bike’ and ten seconds later I was back inside, having coffee with him and talking bikes. His name was Sami and he was a photographer from Helsinki. He told me that he was exploring the gravel roads along the border with Russia, and since he was also going north from Kuhmo, where we had stopped, he invited me to join him. As I had plenty of time and no schedule for the day, I was happy to have some company. We rode on back roads for about 100km, but not gravel, since there were no gravel roads near the border in that area, and then we he waved at me to stop. We had just passed a building at a crossroads and he asked me ‘are you interested in history?’ ‘Sure’ I said. It turned out that the building behind us was a museum about the Winter War, and the road to the right, the road that used to lead to Russia where the most important battle had taken place. There were still some pieces of artillery scattered along the road, and Sami gave me a very interesting history lesson. 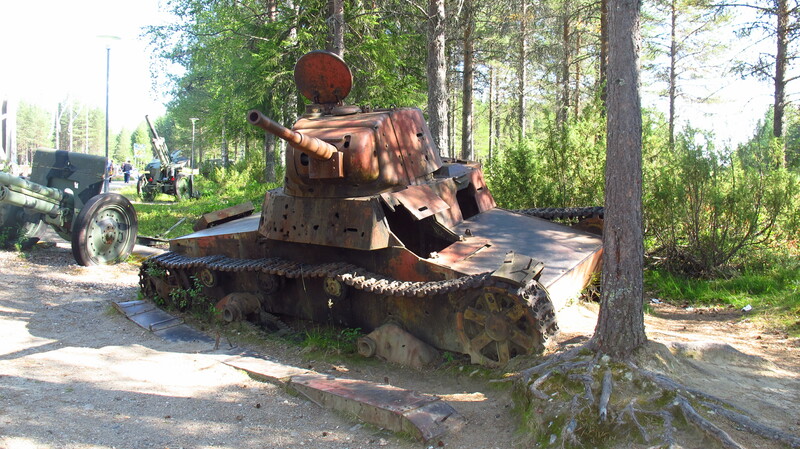 He was very knowledgeable, and he had even used some of the actual artillery guns the Finns had captured from the Russians in that battle during his military service. We rode the gravel road for a while, saw a memorial and then went back to the main road. A while later we came to a crossroads, and we parted out ways, as I wanted to try and go further north before sunset and he was going to get some food in the next big town and then go off road and find a place to camp. He gave me his contact and told me to get in touch when I was in Helsinki. Before leaving, he gave me one last piece of advice: I was soon going to cross into the Lapland region, and he told me that there were a lot of reindeer walking around and it was dangerous to cars and especially motorbikes. I thanked him, and sure enough, about half an hour later I saw the first one, lazily walking down the road. I slowed down and rode past it, but it disappeared into the forest before I could stop to take a picture. After that, I saw dozens of them. At about 7 pm I stopped to buy some food and then started looking for a place to spend the night. 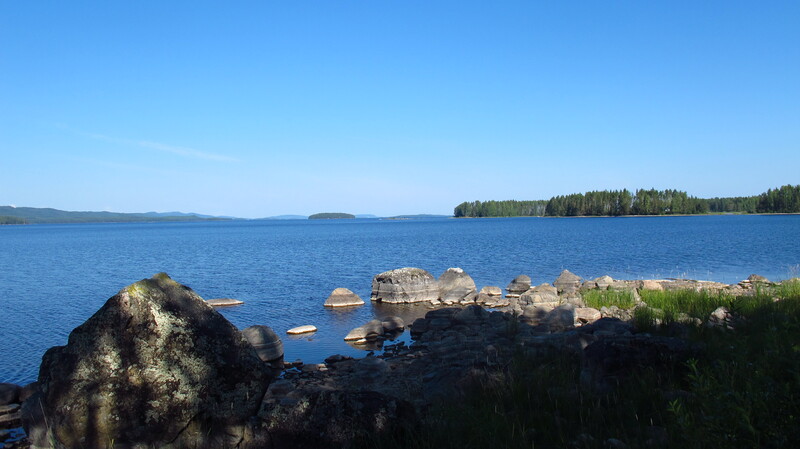 There were lakes everywhere, and I fancied camping near the shore and maybe have a swim, and a few miles out of town I saw the entrance to a campsite. I asked and it was only 7€, so I decided to stop there, it would be nice to be able to have a shower. The campsite was just an open grass field by the lake, and you could put your tent wherever you wanted. I camped, and since it was still early, I cleaned and greased the chain, took the panniers off the bike and rearranged my stuff, getting rid of a few things I had not used and was not going to, trying to shed some weight. I also did some repair work on the straps that held the jerrycan in place. The vibrations had managed to cut one of the two straps and the other one was badly frayed, so I repaired one and reinforced the other with duct tape. 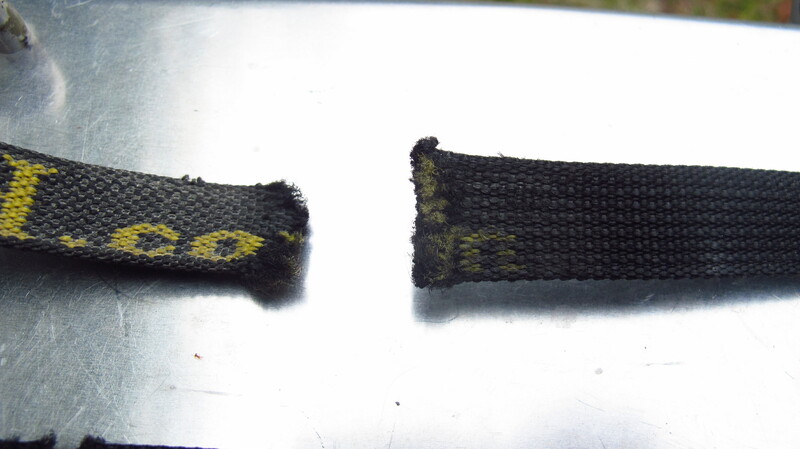 There had only been really bad vibrations in Kazakhstan, so I was surprised to see that the straps had failed. After discovering it when the rim broke, I had secured the jerrycan with some rok straps until I could find a better solution. I had bought the whole thing, jerryan, support and straps from Touratech, and they are supposed to be high quality products for trips just like this. 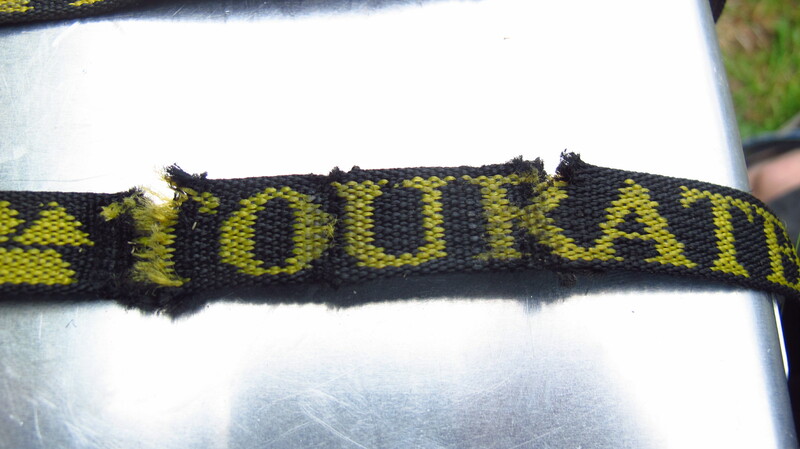 I doubt the straps would have lasted more than a week in Kazakhstan, so it was a disappointment. I took some pictures and they will definitely hear from me when the trip is finished. 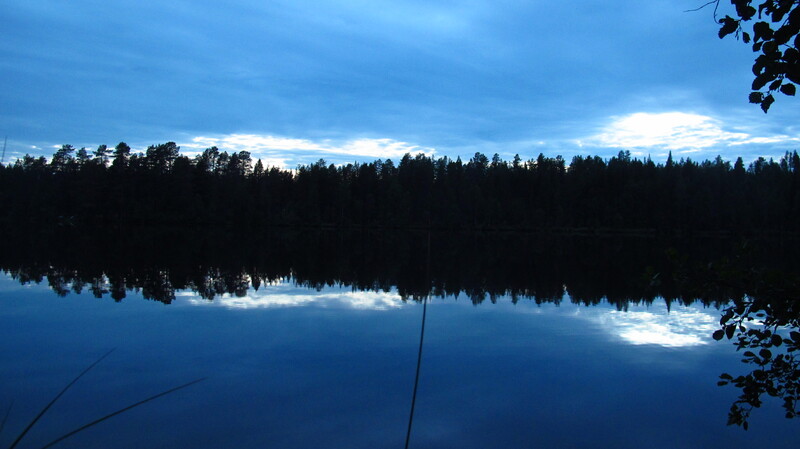 I cooked dinner on my stove and then sat by the lake before going into the tent to write a bit. It was a magical moment, and I felt relaxed as I had not been for weeks, in complete harmony with myself and my surroundings. This was what I was looking for. Gazing across the lake, with my bike and my tent behind me, I felt I did not need anything else. It was almost midnight when I went into the tent, and there was still enough light to be able to sit outside and read a book without problems. I wondered whether it would get dark at all that night. 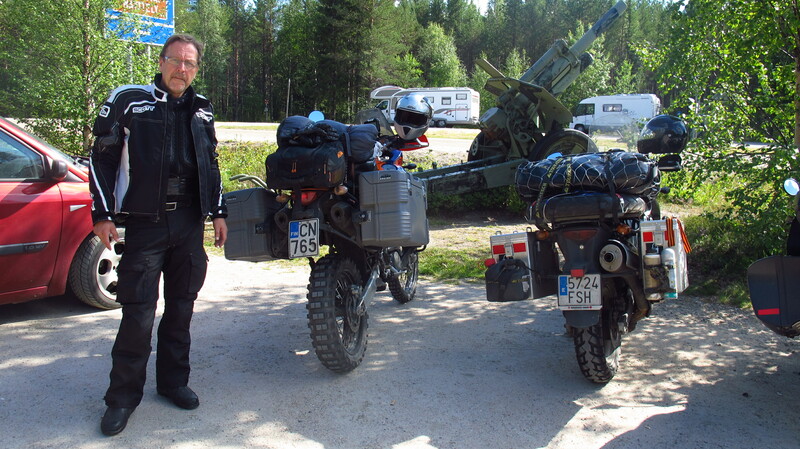 This entry was posted in Stroming The World 2013, Travel and tagged Finland, KTM, Winter War by Kilian. Bookmark the permalink.